The OUT MiniModule is a signal output module for generating analog variables. 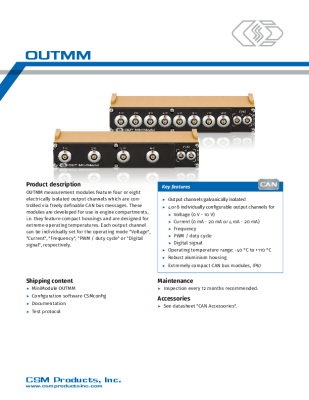 The OUT MiniModule (OUTMM) provides configurable output signals in accordance with a value that has been pre-defined by CAN bus messages. Typical use cases for an OUTMM are test benches with analog display units and actuators as well as the simulation of parameters in early development stages (HIL testing). Thus, the module can simulate not yet existing control units and output signals to actuators. It also provides options to transfer available CAN signals to test benches with only analog measurement inputs. This means, a CAN signal which - due to a lack of digital signal inputs - cannot be directly fed into a test bench will be first transmitted to an OUTMM and converted into an analog signal. This analog signal will then be transmitted to the analog signal input of the test bench. Depending on the device version, an OTUMM features four or eight galvanically isolated output channels. The output channels are controlled by freely definable CAN bus messages and offer high accuracy in every operating mode. Each channel can be configured individually with a refresh rate of up to 1 kHz. OUTMM modules are supported by the data acquisition software vMeasure. Centrally controlled power supply of the entire measurement chain: A CAN-based Power Control MiniModule (PCMM) serves as a central power distribution for distributed measurement setups.